Meat-eating rabbits: study finds that the fluffy creatures are not exactly "herbivores"
In an ironic twist of fate, researchers have found that hares can feast on carcasses, complementing their diet with animal meat — including meat from their own kind and even one of their predators, the lynx. 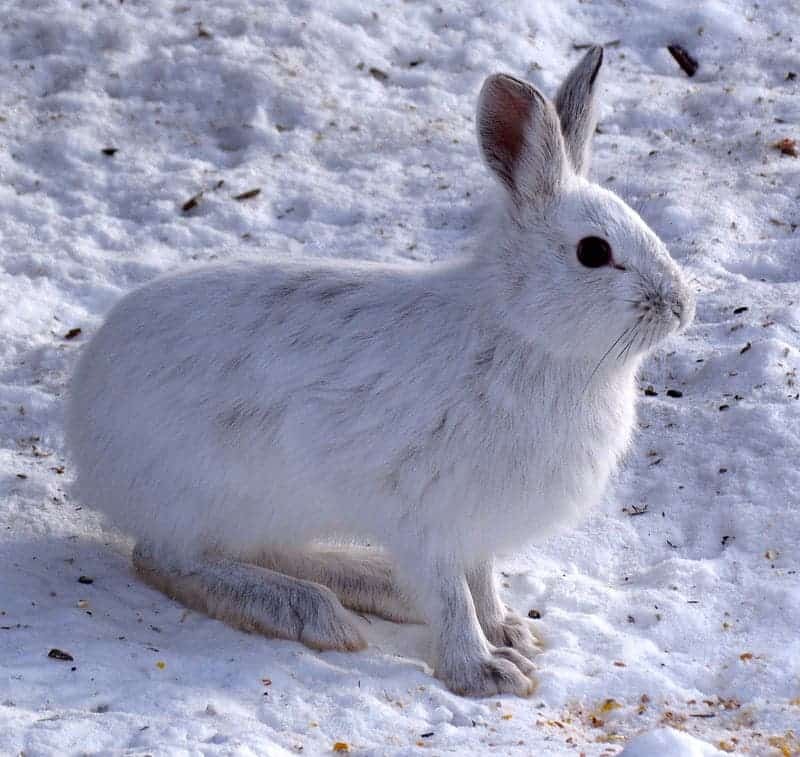 Snowshoe Hare (Lepus americanus), white morph. Image credits: Shirleys Bay. Peers found out about this by accident. He deployed hare carcasses at various points in Canada’s Yukon area, setting up remote cameras next to them. He was expecting to see larger predators like wolves coming to feast, but this wasn’t the case. Instead, he recorded evidence of cannibalism as hares came to devour their own. In an even more surprising twist, not only do the hares dabble in cannibalism, but if given the chance, they will also eat the meat of one of their main predators, the Canada lynx. In one case, an individual was even found to repeatedly ingest feathers from a Spruce Grouse (Falcipennis canadensis) carcass. Peers believe that the hares (Lepus americanus) do this in order to boost their protein intake in the rough Canadian winters, when nutrients are scarce and protein is a luxury. The hares were also territorial with their carrion, protecting it from other individuals. Peers suspects that hares haven’t been spotted munching on larger carcass such as reindeer due to the competition from proper predators. This isn’t the first time “herbivorous” creatures have been found to munch on meat. Anecdotally, scientists have reported different species of rabbits eating meat since 1921. Pet owners have also reported it from time to time — but this is the first time it’s been caught on camera and described in a scientific setting. Previously, in Ontario, biologist Kevan Cowcill set up cans of partially opened sardines throughout the boreal forest and also found that hares came to eat the stash. However, he did not publish his results in a peer-reviewed journal — and perhaps Peers also wouldn’t have, had it not been for the very unusual grouse carcass. Although it was only one observed case, it’s still shocking. Ingesting feathers is extremely unusual in the animal world, because they are made of almost entirely keratin — meaning they contain very little protein. It’s entirely unknown how the hare stomach would break down feathers and what nutrients it could derive from it. Potentially, it could be a source of fiber. Overall, carrion consumption is becoming increasingly reported for animals once thought to be true herbivores. Particularly in cold areas, these animals work on a protein-deficient diet and would not say no to the occasional meat offering. The study “Scavenging By Snowshoe Hares (Lepus americanus) In Yukon, Canada” was published in Northwestern Naturalist.